Submitted by The Amethyst Dragon on 2018-11-20 13:21. 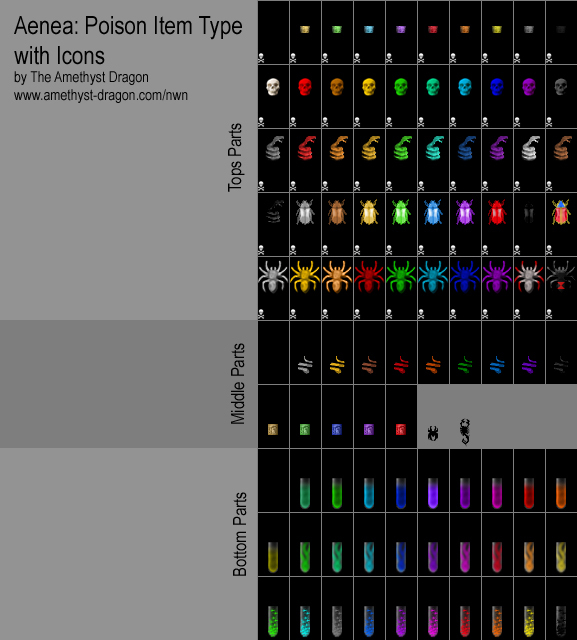 Created for the World of Aenea PW several years ago, these inventory icons were made so that poisons could have their own 3-part inventory icons and new item type. Just like potions, these layer the three images to create a composite in the players' inventory. Each bears a tiny skull and crossbones in the lower corner to make them visibly distinct from potion items. The hak includes a copy of the CEP 2.65 baseitems.2da file with these poisons added as a new item type at line 503. Thank you very much for fulfilling my request and having published these, I have some icons that I created in addition of these, in a few days I will publish these if you like.